A woman in La Habra was killed by a bus while riding her bike across the crosswalk. Annette Ferrin-Rodgers, 49, was killed at approximately 8:28 pm last night at the intersection of Beach Blvd and La Habra Blvd in La Habra, when a bus turning left onto La Habra from Beach struck her. The driver reported seeing something in the crosswalk, but was unable to stop despite traveling at an estimated 15 to 20 mph. A mail processing clerk at the Santa Ana USPS processing center, Ferrin-Rodgers was reportedly riding without lights an hour after sunset. Police also stated that riders are required to dismount and walk across a crosswalk. However, that’s only true where riding on the sidewalk in prohibited, since the crosswalk is considered an extension of the sidewalk, or where DOT-conforming signage requires it; according to comments, riding on the sidewalk is legal in that area. The driver has been tested for drugs and alcohol, as per USDOT guidelines, and will be on administrative leave while the investigation proceeds. 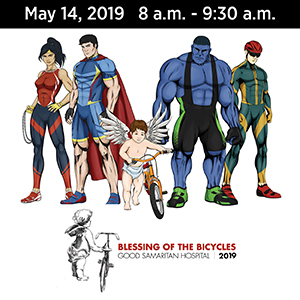 C.I.C.L.E.’s Urban Expeditions celebrates Earth Day with the Lorax Ride on Saturday, April 24, beginning at 10 am at Memorial Park in Pasadena. Sunday the 25th marks the monthly Black kids on bikes – Freedom Ride in South L.A., a fun, medium-paced ride that rolls at 1 pm the last Sunday of each month. If you were at the Streetsblog fundraiser at Eco-Village earlier this month, you saw the premier of the great new StreetsFilm about the Freedom Ride by Ivy London; if not, look for it when it goes online next month. On the other hand, Will Campbell’s Bike Every Satur(Day) In May rides don’t kick off for another week. Twenty-four-year old pro cyclist Leonardo Grullon was killed in the Domican Republic when he and four other riders were hit by a truck while training for the Pan American Championships. Lance’s new Team RadioShack takes a hit as Chinese rider Li Fuyu tests positive for Clembuterol. BMC Racing Team’s Thomas Frei is suspended after testing positive for EPO, while BMC riders Alessandro Ballan and Mauro Santambrogio are suspended as part of an ongoing drug probe. Meanwhile, CSF rider Mattia Gavazzi tested positive for cocaine and ex-pro Cristof Kerschbaum faces trial for dealing EPO and other performance enhancing drugs. In non-doping pro news, the legendary Eddy Merckx is honored with a stamp by his native Belgium on his 65th birthday, while Lance is named the most influential athlete in the U.S.; oddly, Tiger Woods is no longer on the list. 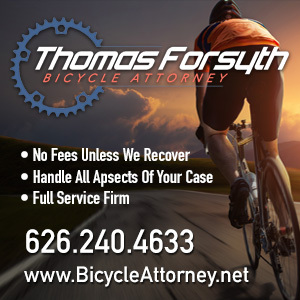 Cyclelicious reports that a movie is in the works about Major Taylor, the nation’s first black athletic superstar and bike hero a century before Lance. A Midnight Ridazz art exhibition opens in Long Beach’s Exhibit [A] Gallery. Metro Chair Ara Najarian says there will be bike lockers and racks at the new Westlake/MacArthur Park development after all; maybe they planned it all along, maybe they’re just responding to Stephen Box unnamed bloggers. A new coalition called Living Streets wants to know what local streets should become Living Streets. Who tickets the Parking Enforcement officers when they’re the ones blocking the bike lane? L.A. Cycle Chic looks at the bikes of Coachella. A road diet, including diagonal parking — and yes, bike lanes — is being considered for Culver Blvd in Playa del Rey. Need a job? 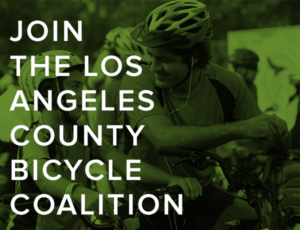 Green LA Transportation Working Group is looking for a Living Streets Project Coordinator. 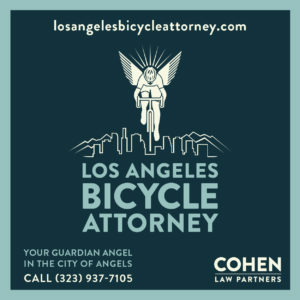 Long Beach celebrates Earth Day with two miles of new bike lanes; L.A. celebrates Earth Day with, uh…. Claremont gets cool new bike racks, I like the multi-colored ones; Claremont Cyclist shares my philosophy of supporting your local bike shop. The new U.S. Cycling Hall of Fame opens Saturday in Davis. A Sonoma cyclist offers drivers a little courtesy and asks for the same in return. Why do they always talk about unsafe cycling and not unsafe driving? Giant unveils what may be the world’s first female-specific fixie. A Tucson writer suggests banning all cars to make the city’s streets safe for cyclists. Boston Biker discovers the joys of going slow. A look at Emily Kreisa, Denver’s street-smart bike planner, while the Mile High City debuts the nation’s largest bike share program. The presidential motorcade through New York results in the confiscation of countless bikes for fear of bike bombs along the route. A Pennsylvania police officer hits a cyclist while responding to a call; the officer is not suspended. Indiana’s Little 500 bike race — made famous in the best bike movie ever — rolls this weekend; a Kappa Delta sophomore is the third member of her family to compete. Finally, in case you wondered what the hell the New York Critical Mass cyclist-bashing cop was thinking, it turns out he thought he was the one being assaulted. No, seriously.